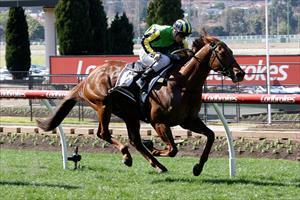 A claim and a fit horse combined to help Strike Force lead all the way in the My Punter Handicap (1600m) at Moonee Valley on Saturday. With Lachie King taking three kilograms off, Strike Force was harassed in the lead but was brave in the straight to come clear and defeat Romanesque by 1-1/4 lengths. “We’d planned to ride him like that but he got attacked in front a bit,” Moroney said. “I was hoping Lachie would try and hold them out and he did. This track suits him as well with tight corners and he can get around them like a greyhound. “He’s a horse you need to be aggressive on and he’ll stick on for you. It is the sixth win for Strike Force, purchased as a yearling for $120,000 at the Magic Millions Gold Coast sale. Congratulations to R & C Legh Racing Pty Ltd, Mr L Petagna, Pulitano Thoroughbreds Pty Ltd, Kariba Racing, G J D M Racing, Mr J Versace, Grandlodge Racing Pty Ltd, Mr A Melideo and Mr M Ragusa.